The Edge of Love: Or, The Edge of Sleep. The poet Dylan Thomas has inspired more than his share of biopics, probably because he was thoughtful enough to lives the kind of live that makes for good drama: his genius in full bloom at a young age and in tumultuous times (he wrote World War II propaganda films for the government when he wasn't writing verse), his vices—women and drink—threatening to consume him, an untimely and mysterious death. 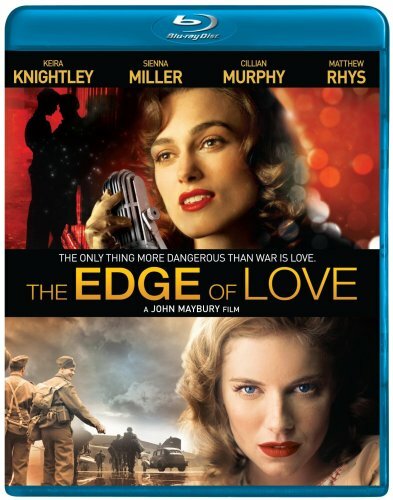 The latest, British director John Maybury's The Edge of Love, offers a slightly different angle to the story by placing the focus on the women in his life—his wife Caitlin (Sienna Miller) and childhood first love Vera (Kiera Knightley), a largely fictional creation. It packs in a lot of events but never quite gets around to a good story. Though Caitlin is jealous and possessive, initially mistrusting her husband's intentions with cabaret singer Vera, his old friend and lover, the two quickly warm to one another, probably so they can cling together to preserve body heat rapidly exiting their frail frames (I've said it before, Kiera, but eat a sandwich). Both women suffer the travails of difficult marriages—Thomas is perpetually drunk and Vera's husband William (Cillian Murphy) is sent off to war and comes back a shell of a man. They fight, they make up, they do cinematic things like run around on the beach laughing and having a fine montage. Maybury infuses all of it with a lot of style—William's war experiences are hastily sketched but effective, and makes the most of the dismal British countryside to mirror the country's wartime malaise, but the script, by playwright Sharman Macdonald (Knightley's mother! ), doesn't much warrant the effort. The acting is very good—Miller continues to grow, and Knightley even sings a few songs (though it's hard to buy her as anything approaching a working cabaret performer)—but it's hard to get invested in repeated scenes of marital infighting or buy what is clearly supposed to be an empowering friendship between the women. Certainly the case that Vera is the inspiration for one of Dylan's famous poems is a little weak. It's not a bad movie, but it doesn't add up to much more than a glorified romantic melodrama. The DVD: This very pretty film received a very pretty transfer, with the clarity, color, and detail you've come to expect from Blu-ray. Some interior scenes don't "pop" the way the best transfers do, but it's still a very fine effort. The audio is very fine as well, surrounding you with the sounds of a country under siege and shaking the ground with LFE every time a bomb drops. The perfunctory extras include a reserved commentary from the director, a 10-minute promotional featurette, and the trailer.